1 of 5 Bring a pot of lightly salted water to a boil. Prepare Marinade. In a medium-size bowl, whisk lime juice, olive oil, chili powder, cumin and salt. Set aside 2 tablespoons and pour remaining mixture into a large resealable plastic bag. 2 of 5 Quesadillas. Add chicken to marinade in bag. Refrigerate while heating grill to medium-high heat. 3 of 5 Add corn to boiling water. Cook 1 minute. Remove from heat; drain. 4 of 5 Once grill is heated, place corn on grill and cook 12 minutes, turning, until some of the kernels are a little charred. Remove from grill and cut kernels from cobs. Combine in bowl with beans and reserved marinade. 5 of 5 Remove chicken from bag, discard marinade and grill about 2 minutes per side. Slice into thin strips. Place 2 tortillas on grill. Top half of each with 2 tablespoons of the cheese, some of the chicken strips, a heaping 1/4 cup of the corn mixture and 2 tablespoons more cheese. Fold in half and grill 1 minute. Turn over and grill another minute. Repeat with all ingredients. 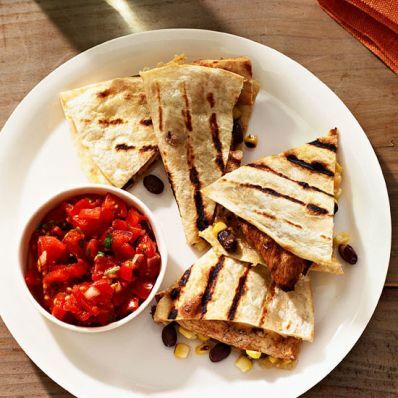 Serve quesadillas with sour cream and salsa, if desired.